We're Passionate About Our Coffee! All I Have a Bean coffees are single origin. They buy their beans from individual farmers in Central and South America, Africa, and Asia, not from large coffee cooperatives,. This gives the greatest economic benefit to those select farmers who meet I Have a Bean's rigorous quality standards. Their coffee is amazingly fresh! All I Have a Bean coffee is air-roasted the day our order order is placed, and delivered to us the same day. So the coffee we serve you is as fresh as it can be, retaining all the flavor notes you expect in truly fine coffee. We support local small businesses to help create jobs in our local economy and strengthen the fabric of our community. I Have a Bean is local (Wheaton), they are small (and growing nicely), and they are very, very good at what they do. Stop in for a great cup of freshly brewed I Have a Bean coffee or one of our classic espresso drinks like Café Latte, Cappuccino, Café Mocha, and more. We also serve delicious iced tea, and iced coffee and espresso drinks. 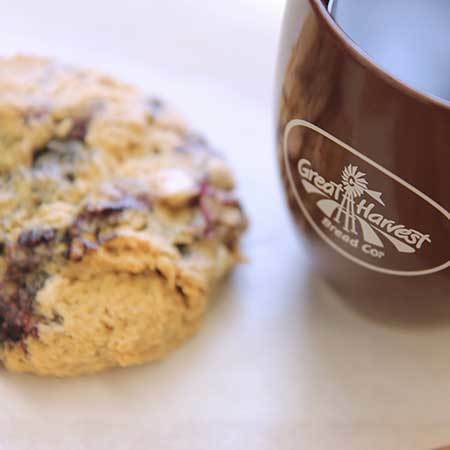 Make Great Harvest your neighborhood coffee shop. Enjoy I Have a Bean coffee at home. We carry a great variety of their select whole bean and ground coffees.